Contact - Artisan-Crafted Gelato and Sorbet: family owned and full of fresh, homemade goodness! 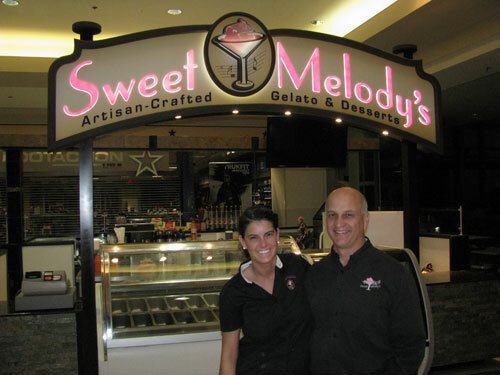 Thank you for your interest in Sweet Melody's Artisan-Crafted Gelato. Your feedback is very important to us. If you have a question, concern or suggestion, we'd like to hear it! Send us a brief note and someone will get back to you as quickly as possible. If your need is urgent, please call Chuck on his cell at 716-481-7015. Owner Chuck Incorvia and daughter Allie at the Boulevard Mall Kiosk. Your Email address will never be shared or sold to any third party. If your inquiry involves catering or any other issue where you need to speak with us directly, please include your phone number here. In your comments, please also include the best times to reach you.